This Hyannisport residence underwent a major structural renovation with the addition of a new freestanding carriage house on the property. The landscape followed suit with a complete overhaul to reflect the new and refurbished structures. 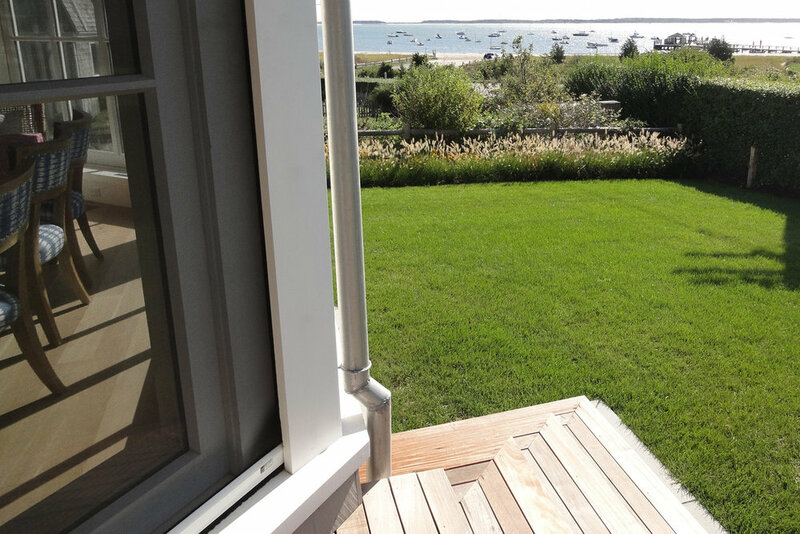 Materials that are in keeping with the waterfront vernacular are used in clean lines to create a contemporary landscape. A new flush wood boardwalk connects the main house to the carriage house, bands of hydrangea extend from the crushed shell parking court, and long swaths of ornamental grasses define the edge of an open lawn for play. Custom wood, steel, and granite fencing at the edges of the property are designed with a light industrial look that gives a nod to the waterfront docks. Possible second phase elements including pool and custom lounge seating were developed in the planning phase, which can be accommodated with the current design if desired in the future.